Isaac Ahmad is a Program Manager at Duke Corporate Education. As a Program Manager, Isaac helps to deliver customized executive programs, integrating innovative experiential learning activities and content for his clients’ business challenges. He acts as a point of liaison between key parties and manages the logistical aspect of the design and delivery phases in order to ensure a seamless learning journey. Prior to joining Duke CE, Isaac worked in HR communications in the banking and finance industry. He has worked for ABN AMRO Bank NV, Standard Chartered Bank, Bank of America, Merrill Lynch and his latest stint was with Barclays Bank PLC. He also spent three years as a flight attendant with Singapore Airlines. 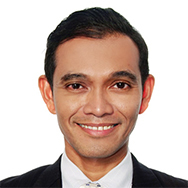 Isaac graduated with a Master of Science in Communication Management from Singapore Management University (SMU) and Bachelor of Applied Science from Nanyang Technological University (NTU). Isaac’s interests are in sports and the arts. He was a dragon boat paddler, coach and official. He spends his other free time cooking thai and malay dishes. He speaks English, Malay and Thai.